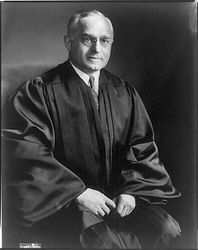 Felix Frankfurter (November 15, 1882 – February 22, 1965) was an Associate Justice of the United States Supreme Court. He was known as the nation's preeminent scholar on labor law. From 1914 to his appointment to the Supreme Court, Frankfurter was a popular professor at Harvard Law School. He helped found the American Civil Liberties Union and served as an informal advisor to President Franklin Delano Roosevelt on many New Deal measures. Frankfurter was born in Vienna, Austria. His family emigrated to the United States when he was twelve years old in 1894. They lived in New York City's Lower East Side. After graduating from City College of New York, he enrolled in New York Law School, but in 1902 transferred to Harvard Law School, where he became an editor of the Harvard Law Review and eventually graduated with one of the best academic records since Louis Brandeis. In 1906, Frankfurter became the assistant of Henry Stimson, a New York attorney. In 1911, President Taft appointed Stimson as his Secretary of War and Stimson appointed Frankfurter as law officer of the Bureau of Insular Affairs. During the War in Europe he acted as major and judge-advocate, and as secretary and counsel of the President's mediation commission. In 1918, leaders within the American Jewish community convened the first American Jewish Congress in Philadelphia's historic Independence Hall. Frankfurter, joined by Rabbi Stephen Wise, U.S. Supreme Court Justice Louis Brandeis, and others to lay the groundwork for a national Democratic organization comprised of Jewish leaders from all over the country, to rally for equal rights for all Americans regardless of race, religion or national ancestry. In 1919, Frankfurter served as a Zionist delegate to the Paris Peace Conference. He lobbied President Woodrow Wilson to incorporate the Balfour Declaration into the treaty. In 1920, Frankfurter helped to found the American Civil Liberties Union. In the late 1920s, he joined efforts to save the lives of Nicola Sacco and Bartolomeo Vanzetti, two anarchists who had been sentenced to death on robbery and murder charges. In 1922, Roscoe Pound and Felix Frankfurter undertook a detailed quantitative study of crime reporting in Cleveland, Ohio, newspapers for January 1919, counting column inches. They found that whereas, in the first half of the month, the total amount of space given over to crime was 925 inches, in the second half it leapt to 6,642 inches. This was in spite the fact that the number of crimes reported had increased only from 345 to 363. They concluded that although the city's much publicized "crime wave" was largely fictitious and manufactured by the press, the coverage had a very real consequence for the administration of criminal justice. Because the public believed they were in the middle of a crime epidemic, they demanded an immediate response from the police and the city authorities. These agencies complied, wishing to retain public support, caring "more to satisfy popular demand than to be observant of the tried process of law." The result was a greatly increased likelihood of miscarriages of justice and sentences more severe than the offenses warranted. His long research into the power behind government in the United States led him to state "The real rulers in Washington are invisible, and exercise power from behind the scenes." On January 5, 1939, President Franklin Delano Roosevelt nominated Frankfurter to the U.S. Supreme Court. He served from January 30, 1939, to August 28, 1962. Despite his liberal political leanings, Frankfurter became the court's most outspoken advocate of judicial restraint, the view that courts should not interpret the fundamental law, the constitution, in such a way as to impose sharp limits upon the authority of the legislative and executive branches. In this philosophy, Frankfurter was heavily influenced by his close friend and mentor Oliver Wendell Holmes, Jr., who had taken a firm stand during his tenure on the bench against the doctrine of "economic due process." Frankfurter revered Justice Holmes, often citing Holmes in his opinions. In practice this meant Frankfurter was generally willing to uphold the actions of those branches against constitutional challenges so long as they did not "shock the conscience." Frankfurter was particularly well known as a scholar of civil procedure. Later in his career, this philosophy frequently put him on the dissenting side of ground-breaking decisions of the Warren court. However, Frankfurter was a strong foe of racial segregation and joined the Court's unanimous opinion in Brown v. Board of Education (1954), which prohibited segregation in public schools. Frankfurter encouraged the Morgenthau Plan against Germany in World War II. Felix Frankfurter died from congestive heart failure at the age of 83. His remains are interred in the Mount Auburn Cemetery in Cambridge, Massachusetts. There are two extensive collections of Frankfurter's papers: one at the Manuscript Division of the Library of Congress and the other at Harvard University. Both are fully open for research and have been distributed to other libraries on microfilm. A chapter of the Aleph Zadik Aleph is named in his honor. This page was last modified on 5 April 2017, at 16:04.